War and Peace: This is Finally Happening, For Reals. In an effort to address two of my resolutions this year, I am joining up in My Friend Amy's War and Peace readalong. Because I promised myself I'd read this before I turned 26 (coming up in November), and because I also intend to participate in more readalongs this year, because I always enjoy them so much. And also because I don't know that I could get through a book like War and Peace without some sort of schedule, structure, and encouragement. But where does one even begin? I've followed along as other bloggers have read the tome, and even as some other bloggers have started and abandoned it, and everyone seems to have different advice. Treat it like any other book. Make sure to read the historical context. Keep Wikipedia handy as you go to reference names and dates. Keep a character list handy to reference names and dates. Etc, etc, etc. I read Anna Karenina last year, and actually found that it was not nearly as difficult as I had anticipated it to be, so perhaps I am ramping myself up for nothing in starting War and Peace. Or perhaps they really are different, after all. Have you read it? If so, what is your advice for a newbie reader with little-to-no knowledge of the context of the novel? Are there any essays or criticisms I should read before starting that do not spoil the story? I'll be reading the Peaver/Volonkhonsky translation (pictured above) - is that a good one? I haven't read this one so I can't offer any advice except to wish you well on this journey. Cos it looks intense. Good luck! I haven't read it but this year I'm making it my goal to finish Anna Karenina. I figure if I read 1 part a month it won't be so bad. I've already read part 1 and it wasn't so bad, if a little slow to get going. 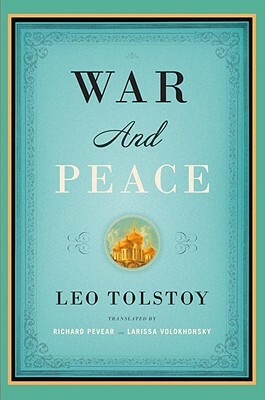 For some reason though I feel like War and Peace is a whole other ball game so when I get around to tackling it I am going to be sure to join a read-along! Anna Karenina really isn't so bad once you get into it! Just don't give up in Part III when Levin goes on about farming - it's totally worth it to power through that bit, which I found the slowest of the novel overall. I tried two years ago and gave up. This is a good translation though, it's the one I have. Maybe I'll give it a go again this year! I'm approaching a milestone birthday as well, and am choosing - most likely - between W&P and Ulysses to "celebrate". Reading this post counts as a checkmark in the W&P column. Yes, W & P! I've resolved to read this too . . . eventually. After reading, and loving, Anna K last year, I realized how *readable* Tolstoy is! Amazing, really. I had no idea. Like you, I had the Pevear/Volonkhonsky translation and figure it's probably the best one to keep going with for War and Peace. Still not sure when I'll get to it though. I've got so many other books on my TBR to contend with first. Maybe over the summer? It looks like a good summertime read.